Bishop's Stortford is a historic market town and civil parish in Hertfordshire, England. It is just west of the M11 motorway on the county boundary with Essex and is the closest sizeable town to London Stansted Airport. Bishop's Stortford is 27 miles (43 km) north east of Charing Cross in central London and 35 miles (56 km) from Liverpool Street station, the London terminus of the line to Cambridge that runs through the town. Bishop's Stortford has a population of 38,202, adjusting to 37,838 at the 2011 Census. Nothing is known of Bishop's Stortford until it became a small Roman settlement on Stane Street, the Roman road linking Braughing and Colchester. The settlement was abandoned in the 5th century after the breakup of the Roman Empire. A new Saxon settlement grew up on the site, named Steort-ford, the ford at the tongue of land. In 1060, William Bishop of London bought Stortford manor and estate for eight pounds, leading to the town's modern name. At the time of the Domesday Book the village had a population of around 120. 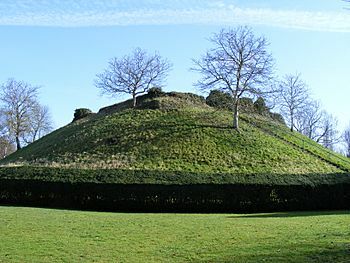 The Normans built a wooden motte-and-bailey edifice known as Waytemore Castle (see below). Only the baptismal font survives from the Norman church of St Michael's, which was rebuilt in the early 15th century and altered and restored in the 17th and 19th centuries. Its conspicuous belfry and spire were built in 1812. The River Stort is named after the town, and not the town after the river. When cartographers visited the town in the 16th century, they reasoned that the town must have been named for the ford over the river and assumed the river was called the Stort. By 1801, Bishop's Stortford was a market town, and a corn exchange had been established. while the main industry was malting. In 1842 the railway came to Bishop's Stortford. Another Victorian introduction was the opening of a hospital in 1895. During World War II, Bishop's Stortford was the evacuation centre for many Britons, including Clapton Girls Technology College. 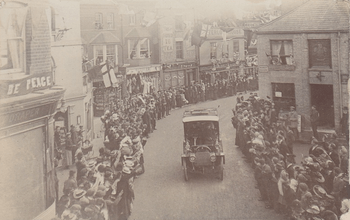 By 1951, Bishop's Stortford's population had reached 13,000, and growth as a commuter town continued through the second half of the 20th century. The M11 motorway, Stansted Airport, and rail links to London and Cambridge contributed to its rise in population to about 35,000 in the 2001 national census. Of the six suburbs of Thorley, Thorley Park, Havers, Bishop's Park, St Michael's Mead and Hockerill, the last is a separate ecclesiastical parish east of the River Stort, centred around the old coaching inns, All Saints in Stansted Road and the railway station. Post-war development has enlarged the town's area further. The town centre recently underwent changes with the demolition of a multi-storey car park and surrounding area to make way for a new town centre area and city-type apartments and penthouses on the riverside and elsewhere. Jackson Square (a modern shopping complex) was rebuilt and an extension added. The Havers estate, on the edge of the town, is being redeveloped with new houses and flats. Bishop's Stortford railway station is on the London Liverpool Street to Cambridge main line operated by Abellio Greater Anglia. The Stansted Express services take around 25 minutes to reach Tottenham Hale and 40 minutes to reach London Liverpool Street and allow Bishop's Stortford to be part of the London Commuter Belt. Epping tube station is about 12 miles (19 km) away from Bishop's Stortford which means some residents use the London Underground station rather than the main line station at Bishop's Stortford. 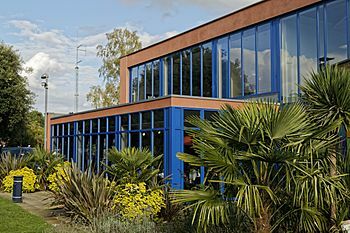 Bishop's Stortford is close to junction 8 of the M11 motorway, which runs from London and the M25 north to Cambridge, and the town is a frequent stop-off point for travellers using the nearby Stansted Airport. To the north of the town is the A120, which meets the A10 at Buntingford to the west and the A12 at Colchester to the east. Stansted Airport is on the town's doorstep, with easy transport via rail or bus between there and the town. This airport is mainly used for flights to Europe and is the third largest airport serving London. The town has many bus routes, including the 308 main bus route for travel within Bishop's Stortford and to Stansted Airport. Other, longer routes like the 510 (Stansted Airport – Harlow) link Bishop's Stortford with other nearby towns, and several services exist to connect the plethora of nearby villages to the town. Semi-professional football team Bishop's Stortford F.C. were formed in 1874, and play at Woodside Park in the town. Currently members of National League South, the sixth tier of the English football pyramid, the club have won two national titles - the 1973–74 FA Amateur Cup and the 1980-81 FA Trophy, the first club to win both competitions. Bishop's Stortford Swifts, who play in the Essex Olympian Football League, are also based in the town. They play at Silver Leys, the home of Bishop's Stortford Rugby Football Club, who play in National League 2 South, the fourth tier of English rugby. The town is home to various youth organisations and youth groups, including an Army Cadet Force detachment and an Air Training Corps Squadron. GAP Youth Group is affiliated with St James the Great Church in Thorley. Rhodes Arts Complex is the town's largest live music venue. A recipient of a National Lottery grant in 2006, the venue hosts both local and international artists, including Midge Ure, The Beat, Ade Edmondson. Other public houses included the 15th century Boars Head, 16th century Black Lion, and the Curriers, now a restaurant. Between 1644 and 1810, The Raindeer operated which is now the site of the Tourist Information Centre. Located in the town centre is Anchor Street Entertainment, a multiplex which contains a cinema, health club, bowling alley, and a number of food outlets. A concrete skateboard park and metal halfpipe is located in the town park. 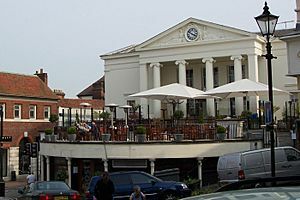 The town is home to two amateur dramatics groups, The Water Lane Theatre Group and Bishop's Stortford Musical Theatre Company. Being in the southeast, the town enjoys a warmer climate than most of Britain and has some of the hottest summers in Britain; it is also one of the driest places in the country. Temperatures may sometimes reach the mid-30s Celsius in the summer. Snow is often seen in the winter months because the town is near to the east coast, where cold, moist air is brought in from the North Sea and cold fronts from northern Europe. In recent years there has been up to three inches of snow early in the year which has resulted in minor disruption to transport and caused some schools to close for several days. However, the snow tends not to persist in any noticeable quantity. The highest temperature recorded at Stansted was 35.0 °C (95.0 °F) during the August 2003 heatwave. In an average year the hottest day should reach 28.8 °C (83.8 °F), and 12.3 days will record a temperature of 25.1 °C (77.2 °F) or more. The lowest temperature recorded at Stansted was −14.7 °C (5.5 °F) during December 1981. Notably cold minimum temperatures tend not to occur due to the lack of higher terrain meaning little cold air drainage occurs. The average annual coldest night should fall to −7.6 °C (18.3 °F), with 47.3 air frosts being recorded in an 'average' year. Typically, the Bishop's Stortford area will receive an average of 622mm of rain during the course of the year. 1mm or more of rain will be recorded on 114.7 days of the year. Temperature averages refer to the period 1971-00, rainfall averages 1961–90. Bishop's Stortford Facts for Kids. Kiddle Encyclopedia.